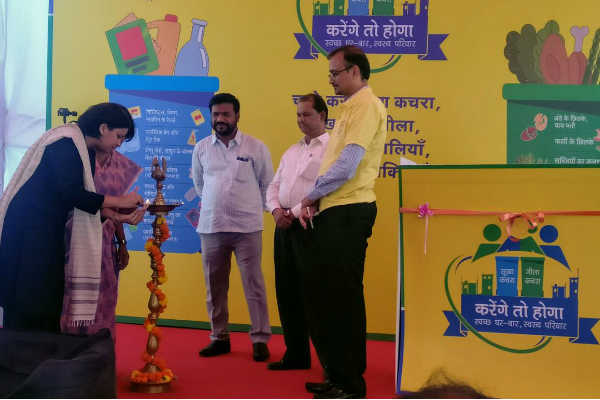 16,000 households in Tunga village slum in Chandivali, Mumbai, will participate in a waste segregation drive, ‘Karenge Toh Hoga – Swasth Ghar Bar, Swasth Parivar’, launched recently, as a part of ‘Mission Garima’, a Tata Trusts initiative in collaboration with the Municipal Corporation of Greater Mumbai (MCGM). The initiative is aimed at engaging citizens in creating awareness about waste management, waste segregation and waste reduction, leading to better waste management practices and an overall goal of a cleaner city. The first phase of the initiative will focus on reaching out to 5000 households. Mumbai on average generates 7,200 tonnes of waste every day. Tata Trusts, with support from the Municipal Corporation of Greater Mumbai (MCGM), has initiated an awareness campaign on waste segregation and management of solid waste, to enable waste disposal in an ecological manner. In order to educate and reinforce best practices through house to house led activation, teams of 3-5 trained local boys and girls called Team Green Blue Champs will be responsible for educating, mobilising and monitoring households in their area. They will talk to women about dry and wet waste segregation and its importance, the value and benefit of segregating and demonstrate best practices on waste segregation. Each team will own approximately 150 households in their vicinity, as defined as per the MCGM maps. Training will be provided to garbage collectors about dry and wet waste segregation and with support of the MCGM, waste collection systems will be mandated. Waste Segregation under Mission Garima is a time bound initiative to test and create an effective and a scalable method that will enable appropriate segregation at the source i.e. at the household level and build that as a sustained behaviour and encourage a sense of responsibility among the citizens.